Moved the camera to track down this Amur Tiger jumping out of water and taking a sprint along the shoreline. This is one of my personal favorite actions shots from that day. Many thanks for your comments and 's! I love all your photos! I am mesmerized by every one I click! Thank you for your kind compliment! This is awesome ! You have an great pfotographer future . I hope I can use it as a reference somethime? Feel free to use my non-stock photos as reference to your traditional and/or digital drawings/paintings. Please send me a link to your finished work, I'd like to see your interpretation. Yes sure and thank you . This is so perfect. I love the composition. Wow that's really so amazing! This is so gorgeous. What a moment to capture. I am a aspiring photographer, and I adore this shot! All your photographs are gorgeous. I especially love this moment you captured. wonderfull composition of this picture! great shot! great shot...very good timing...wonderful colours...awesome action shot I would say!!! What an amazing picture. 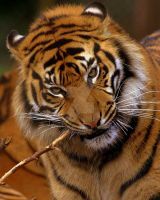 Tigers are so beautiful! This is just stunning and beautiful. Wow. Now that is a fierce tiger. Five digital cameras, six if counting my cellphone.